Yes, we know and we 100% agree that yoga isn’t about having awesome abs. But that bathing suit is calling your name and maybe you could use a little self-confidence boost using your asana practice! How? By directing it specifically to your abdominal wall. Use this yoga sequence for summer everyday along with a little cardio, lots of water and a healthy diet, and your “bathing-suit-body-confidence” will be ready to strut in no time at all! Just don't forget to practice ahimsa (compassion to all including yourself), and allow yourself space to have the confidence to jump into that bathing suit whenever the feeling strikes you no matter what! Start by holding plank for 15 breaths and really commit to it! Create a “warped plank” by fully engaging the hold and summoning all your determination. Kick into your heels, squeeze your thighs towards each other, lift your kneecaps up towards your hips, and your belly button up towards the sky so that your plank very slightly arches upward in the center. Then push the floor away with your hands to broaden your shoulders. Come down to your belly using Chaturanga, and take a yummy Locust Pose to stretch out your core, hips and shoulders. For the second lift, re-find Locust and this time scissor the legs up and down for 10 counts. This will tap into the lower abdominal muscles and strengthen up the inner hip muscles for some of the later movements. Come to a Forearm Plank, squeezing your elbows in towards each other so that your shoulders stay strong. Bring your right knee in towards your right arm and hold, lifting your knee as high as you can and squeezing your right hip towards your right shoulder for 3 breathes. Take 5 reps more quickly and repeat on the left side. This will get into your oblique muscles (side abs). Repeat this twice on each side. Come to Side Plank on your hand or forearm. Lift the top leg up and bring that knee in towards your ribs, pressing your hip towards your shoulder and bending your lifted arm in towards your bent knee. Balance here for 3 breaths then take 5-10 reps in and out. Repeat on the opposite side. Lower down to your belly and stretch out with one vinyasa stepping, or hopping through to a seated position. Keep your feet glued to the ground and reach your hands out on either side of your knees towards your toes. Slowly lower your spine one vertebrae at a time to one inch off the mat in a curling action. At the bottom, hover for 3 breaths and try to come back up in a straight line with arms still outstretched. At the top take a strong Boat Pose for 3 breaths and then repeat this entire action 5 times in slow motion with absolute control. This accesses the entire abdominal wall, but it won’t feel strong without a decent warm up prior like that Plank hold from earlier. Come down to your back for a brief Bridge or Wheel hold, stretching out your frontal plane. Lower to the mat and raise both legs to the sky at about 90 degrees with active toes. Interlace your hands behind your head and lift your shoulders off the ground as you look at the sky. Lift your lower back up off the ground and reach your feet 2-4 inches towards the sky. Pulse only upwards for 2 sets of 10 reps to get a little deeper into your lower belly. We often call these “Plough Slides” in a yoga class and they are very helpful in building the core strength for floating in and out of any posture. From Plough Pose, extend your arms out underneath you on the floor and push your palms into the mat deeply. Extend your legs out and be expressive with your toes so that your legs stay ignited. Begin to slowly lower your spine one vertebrae at a time, uncurling until your tail bone comes to the ground. Then lower the legs in one piece until you're hovering 3 inches off the ground with your arms tucked neatly underneath you. Wait 3 breaths and repeat by bringing your knees back into your chest to start again. Take 5 -10 reps and then rest in Plough or Shoulder Stand. Each level of the uncurling Plough digs into a different set of those abdominals and it strengthens your back muscles and hips too. Rock up to a Boat position and interlace your hands pointing the fingers at your toes. Take 5 V-ups (finger’s reaching to your toes) straight up, then 5 to the right and 5 to the left. Slowly lower your boat to half way and repeat the 15 V up’s. Come down to Raft Pose a few inches off the floor and separate your hands reaching towards each foot. 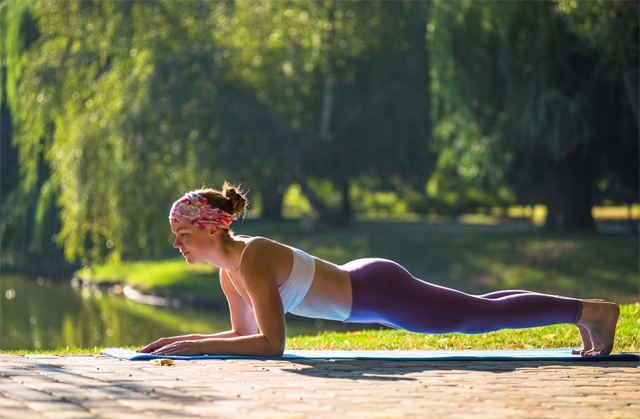 Begin to rock from your shoulders to your tail bone laying flat as board and pausing between each rock – remember the smaller the motion, and the longer the pause, the bigger the core benefits. Repeat this rocking motion 10-15 times with pauses. It feels silly, but boy-oh-boy is it effective! Finally relax into a reclined position with your knees into your chest and take a Reclined Twist followed by Happy Baby Pose. Soften and remind yourself of Ahimsa and the practice of compassion towards yourself and others. Remind your self of how awesome you are, and congratulate yourself on your commitment to your own health and wellness. Derive some confidence from that and move on with your day. The core part of any yoga practice can be the funnest place to push your practice to the next level — mentally and physically — so relax, smile, and have fun!